Anime tutorial draw and color mecha robot. Learn how to draw design, and paint mech robot sci-fi: video step-by-step tutorial with instruction online. A step by step how to sketch and paint to create Mecha concept. Whenever I want to start to come up with concept idea, I usually do this speedpainting concept spend about twenty minutes to an hour to get the idea down. You can watch and learn my process of how to put rough idea onto the paper sketching and create sci-fi character concept art online lesson for comics cartoon illustration, manga, and anime. This one is Eva inspired, I grow up with it during my late teen years. Didn't get to watch much then, but I got the whole series a few years back. New tutorials:-How to draw Mecha Tentacles War Mechine. 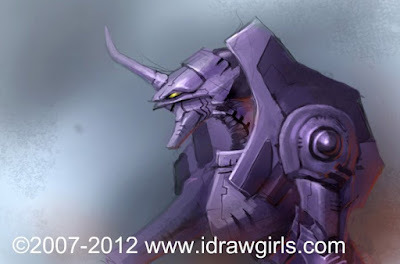 -How to draw Mecha Anime Girl sketch. -Drawing and Painting Battle Angel Alita (Gully). Thanks for all the e-mails and comment guys!!! I really love how you do those artworks. But i dont get how u color all the stuff and how u use the smudge tool to keep it realistic..
Maybe you could do a tutorial just for the way u color it or how to use the brushsettings (opacity/flow). and again i really love your art and drawings and everything! this is exellent and has really helped me with my rendering. I have one question though- what is the tool you use after the first shade you apply on the right side of the mecha? to blend out the shadow? Sam> I paint first stage of value (shadow) on separate layer, then I use softround brush to erase it around the edge. I hardly never use blending tool, some people do. There are many ways to skin the cat, only the end result matters. Ano> Well, if you serious about doing art then you should. If it's just a hobby to you, then you don't need it unless you are rich and have lots of money laying around. Well, I would recommend it because it's easier than real paint, and you can save lots of TREEs that way. The flat brush, just go to default round PS brush-- Open Brushes window the squeeze the circle together, now you got a FLAT circle brush or just plain flat brush. Love it, but i just get really confused with the brushes that u us at the very first stage. when you are defining the shadows what kind of opacity and flow do you use. Beginning: 30% to 50% finding your values. Then final only use mostly 100%. Watch more vids then you will understand. I really appreciate your art and this website...i just recently found out about you...3 days ago lol and your work is amazing.....truly an inspiration to me...i been drawing(sketching) for 10 years now .....trying to use APS cs2...i dont understand the brush your using...the one that doesn't go over the lines you drew for the outline of your drawing...please get back to me on this...thank you.. I would rather get WACOM intuo2-3 or Genius MousePen 6x8. Bamboo is probably way too small to be able to draw anything like that. Peace! k thanks :) .. i think i will go for an Genius 6x8 because i don't have money for an wacom and I'm not such an good artist :) ..
Anonymous> Don't sell yourself short. :) If you use it everyday then you will be good. Practice practice practice and come visit idrawgirls to learn more tips and watch tutorials. Cheers!